Fluorescence Resonance Energy Transfer (FRET) is a powerful technique for characterizing distance-dependent interactions on a molecular scale. It is one of the few tools available that is able to measure intermolecular and intramolecular distance interactions both in-vivo and in-vitro. FRET involves the excitation of a donor fluorophore by incident light within its absorption spectrum. This radiative absorption elevates the donor fluorophore to a higher-energy excited state that would normally decay (return to the ground state) radiatively with a characteristic emission spectrum. If another fluorophore molecule (the acceptor) exists in proximity to the donor with its energy state characterized by an absorption spectrum that overlaps the emission spectrum of the donor, then the possibility of non-radiative energy transfer between donor and acceptor exists. Figure 1 shows the overlap of the cyan fluorescent protein (CFP) emission spectrum and the yellow fluorescent protein (YFP) absorption spectrum; this pair supports a strong FRET interaction. Figure 1: CFP (donor) and YFP (acceptor) absorption and emission spectra. Overlap between CFP emission and YFP absorption (shaded region) leads to efficient FRET interaction. where kD is the radiative decay rate of the donor fluorophore, or inverse of the fluorescence emission lifetime in the absence of the acceptor fluorophore (typically 1 – 50 ns), r is the distance between the two molecules, and r0 is the "Förster distance" that characterizes the 50% efficiency point of the energy transfer. FRET is suited to measuring changes in distance on the order of the Förster distance, which is typically 20 to 90 Å. After energy transfer occurs from donor to acceptor, the acceptor fluorophore is excited to its fluorescence emission state. Because the observed rate of fluorescence emission from the acceptor is rate-limited by energy transfer from donor to acceptor, the quantitative measurement of FRET emission can provide an inferred measurement of distance using the equation above. Accurate FRET determination generally involves comparison of the donor and donor-acceptor fluorescence emission intensities in samples with and without the acceptor present. A ratio measurement is necessary because, as Figure 1 demonstrates, there is typically overlap between the donor and acceptor emission spectra, thus making it difficult to determine with a single measurement exactly what fraction of the fluorescence measured with an acceptor emission filter derives from only the acceptor. Fluorescence lifetime measurements provide more direct results for the energy transfer rate, are not susceptible to concentration variations, and can be made using time domain or phase modulation lifetime measurement techniques. FRET applications are often characterized by very low molecular fluorophore concentrations. Using carefully optimized optical filters is critical in detecting the faint fluorescent emission signals. Semrock BrightLine® fluorescence filters offer the highest possible transmission for maximizing the FRET emission signal, as well as carefully optimized deep blocking out of the transmission passbands, for maximum possible signal-to-background ratios (highest contrast). Figure 2: CFP exciter, dichroic, and emitter filters (from the BrightLine FRET-CFP/YFP-A set) for quantitative measurement of donor emission. Figure 3: CFP exciter and dichroic filters with YFP emitter filter (from the BrightLine FRET-CFP/YFP-A set) for quantitative measurement of acceptor emission. Figures 2 and 3 show the transmission spectra for Semrock's CFP/YFP FRET filter set. The filters in figure 2 are used the quantify the fluorescence from the donor alone (in this case, CFP) while the combination of filters in figure 3 are used to quantify the FRET fluorescence from the acceptor (YFP). It is possible to make these two measurements sequentially with two different filter cubes, where each cube has identical exciter and dichroic filters, but different emitter filters. This approach is not recommended because pixel shift between filter cubes can distort measurements and changing filter cubes takes a comparatively long time and causes vibration in the sample, affecting the distance between molecules of interest. Instead, a more rapid, low-vibration filter change or true simultaneous detection of the donor and acceptor emission are recommended, especially when performing FRET on live-cell samples which are moving. For those who choose to use two separate filter cubes, it is important to select filter sets that are designed to eliminate pixel shift to obtain the most accurate measurements possible. Rapid, low-vibration filter changes can be achieved by using an emission filter wheel. 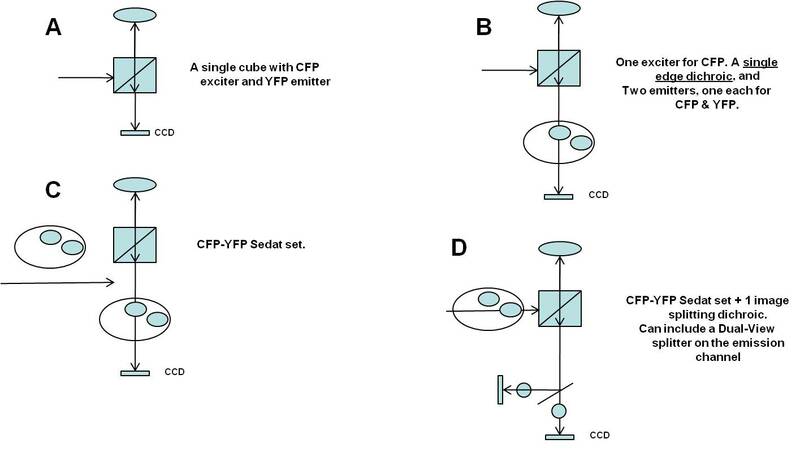 This is the most common microscope configuration for wide-field FRET measurement. Some researchers prefer the flexibility of using a dual filter wheel system (one for exciters and one for emitters), though such systems are more expensive and more complex in terms of software control. For dual-filter wheel systems, the best filter set choice is a Sedat multiband set. Finally, it is also possible to detect both donor and acceptor emission channels simultaneously using two cameras. Several manufacturers make microscope attachments for this application. In addition to the standard FRET filter set an additional dichroic beamsplitter is required to separate the two emission paths in the attachment. J. R. Lakowicz, "Principles of Fluorescence Spectroscopy" (Kluwer Academic / Plenum Publishers, New York, 1999). Paul R. Selvin, "The Renaissance of Fluorescence Resonance Energy Ttransfer," Nature Structural Biology, Vol. 7, No. 9, pp. 730-734 (2000). Handbook of Fluorescent Probes and Research Products, Molecular Probes, www.probes.com/handbook.